Oh, how Benjamin Franklin knew what he was talking about! These wise words may have been spoken such a long time ago, but they certainly resonate with present day digital marketers. When it comes to successfully promoting your business online, preparation is everything. This is especially true for businesses that wrestle with the challenges of social media. If you’re feeling a bit overwhelmed when it comes to social media management for your company, then the tips below are just for you! Just because your business is online doesn’t mean that you should be on every social platform. Not only will this take up way too much time, but some platforms may not be a good match for your business in the first place. The best thing to do is test a few social networks out to determine which work best for your products or services. Once you figure that out, work on building up your followers in each network. Part of this process involves posting on a consistent basis so you can be “seen” by your target audience. It’s also a good idea to study the insights of the traffic that you get. Always be open to tweaking your social media scheduling based on your social analytics. Once you’re focusing on a few social networks that work for your business, you can start filling up your editorial calendar. Ideally, you should plan your social media content a month in advance. If this seems too daunting of a task right now, aim for at least a week in advance. When it comes to the types of content to use, make sure you infuse variety. 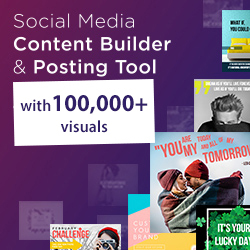 The best content ideas for social media include user-generated content (such as images from your customers wearing or using your products), industry news, contests and behind-the-scenes looks into your brand. This type of content will help your audience identify with your brand, and in the long run it will help you gain their trust. Scheduling these posts in advance will enable you to space them out so you aren’t posting the same type of content all of the time. We won’t tell anyone if you’re still manually posting your updates to social media… but please do yourself a favor and stop right now! There’s so many great tools out there that will allow you to schedule your posts days, weeks and months in advance. 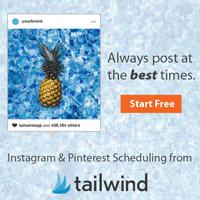 Hootsuite, Buffer, Tailwind, Schedugram and PromoRepublic are a few of our personal favorites. Many of these tools can determine what times of day and night your followers are online the most, and can auto schedule your posts for optimum reach. Scheduling posts in advance will save you tons of time in the long run, and will free up your days to work on your business! Make 2018 the year that you optimize your social media strategy and make maximum use of your time. Don’t prepare to fail… prepare to succeed! Send us a note below, and don’t hesitate to contact us if you need any help with your social media campaigns. We can help you take your marketing to the next level, and have affordable social media management packages for every type of industry!